In addition to our Automatic Screwdriver product line, we offer a complete selection of Nut Runners. MCI/Screwdriver Nut Runners and Automatic Screwdrivers are tooled using either electric or pneumatic motors and many other options as described below. If your are in need of a nut runner, or a Lean Manufacturing Cell, we are uniquely suited in helping you achieve your system requirements. We would be pleased to submit a quotation on a package that meets your automatic nut driver, or screwdriver requirements. Please contact one of our consultants by E-mail, or call us at 317-776-1970. MCI/Screwdriver Systems, Inc. holds numerous patents and trademarks on both automatic scewdriver and nut runner equipment needed to perform the many functions involved in the production of your assemblies utiliizing the highest industry standards. From the nut runner concept to the design of the completed system, MCI Screwdriver Systems will provide you with a system of the highest quality within your required time frame and well within your budgetary guidelines. With our design capabilities, manufacturing expertise, and stringent quality control standards you can rest assured that there is no need to look elsewhere for bits and pieces of your nut runner system. As and option, MCI/Screwdriver Systems, Inc. Nut runners and automatic screwdrivers are available with torque control and monitoring. Both electric and pneumatic devices are available in our automatic screwdriver or nut runner product line. Our pneumatic nut runners are powered by compressed air and vary in terms of air fittings and air consumption. MCI/Screwdriver Systems, Inc. electric nut runners use a DC controller as a power supply. Our hand held tools are lightweight and portable. Pistol-style devices with trigger actuators are also available. We also offer a complete line of fixtured automatic screwdrivers and nut runners. Our large nut runner systems are designed to be mounted in a fixed position, for on-line assembly. Our electric and pneumatic tools are designed to accept sockets with standard sizes of 1/4�, 3/8�, 1/2�, 5/8�, 3/4�, and 1�. Adjustable size drives and metric devices are also available. For nut runners with adjustable receiver heads, we always specify an adjustable range. MCI/Screwdriver Systems, Inc. offers several receiver head styles and performance specifications for nut runners and automatic screwdrivers. 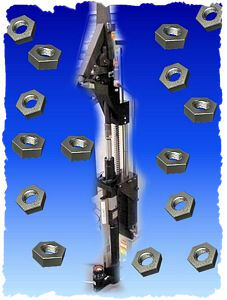 MCI/Screwdriver Systems, Inc., as an option offers offset receiver heads to round out our nut runner product line. 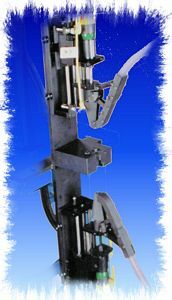 With offset heads, the axis of head rotation is parallel to but offset from the drive axis. Right-angle heads rotate 90� to the drive axis. Crowfoot heads are flat, extended and/or angled heads for difficult-to-access locations. As yet another option, we offer tubenut heads which have openings for slipping over a nut before and after tightening. Performance specifications for nut runners include torque range, rated free speed, and operating noise level. Length, diameter, and weight are always a consideration with detailed descriptions in each of our quotations. We realize that the selection of the type of automatic screwdriver or nut runner that meets your requirements requires precise analysis of your applicaiton applying al available features that MCI/Screwdriver Systems, Inc. has to offer. For example, integral transducers are often used to provide feedback to the controller. Torque levels can be displayed on a tough screen. and we offer ycle counters for tracking the number of tightening cycles in production. Sliding spindles on fixtured automatic screwdriver and nut runners are designed to extend and retract during rotation. Hand held nut runners and automatic screwdrivers often include a reaction bar or stabilizer to facilitate ease of use. Fixtured devices often include a mounting plate or other hardware. Because our automatic screwdrivers and nut runners provide tight torque control, and are used in a variety of precision fastening and assembly applications, typically, they are interfaced with network and statistical process control (SPC) software for quality control and monitoring depending on how each automatic screwdriver or nut runner application depending upon how it is applyed on your assembly line operation.